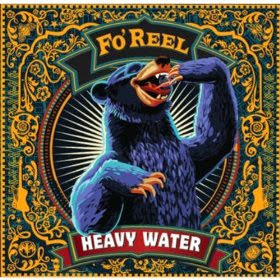 I just received the newest release, Heavy Water, from Fo'Reel and I gotta say it's spectacular! Opening with one of my favorite all time funky blues tracks, Breaking Up Somebody's Home this band sets a solid groove. C.P. Love is a superb singer and he's gunning hard on the first track. Johnny Neel on organ and Mark Domizio on guitar set the pace and Domizio really makes the guitar squirm with his soulful riffs. A super horn section consisting of Jon Smith (tenor sax), Ward Smith (bari sax) and Barney Floyd (trumpet) really add depth to this already deep recording. Excellent! Next up is the title track, Heavy Water, and it has a funky New Orleans jazz funk feel. Love is again leading the way and Daryl Burgess keeps the bottom really tight pushing David Hyde on bass. Nice solos from Neel and Domizio add nicely to Love's lush vocals. Leave Your Love Alone has a change up on vocals lead by Rick Lawson. A walking bass line by Hyde really sets the tempo for this track and with it's orchestral swing feel the horns fill it up. A real cool solo from Neel and Domizio is nicely complimented by a super sax solo from Smith. Blues is a mid paced R&B style track (think Thrill Is Gone) with solid vocals from Lawson and an excellent guitar solo from Domizio and super slippery riffs from Smith. Gate is a terrific instrumental track that puts me in mind of Clarence "Gatemouth" Brown. Opening with clean guitar riffs from Domizio and followed by Neel on keys, a super sax solo from Smith and cool trumpet work from Floyd... this track is hard to beat! Hot! What I Can Do has a cool Latin flavor and Love on lead vocals. Neel is on electric piano with shimmery overtones and organ for fullness. Domizio skips the natural fall back "Santana" solo and puts up some real nice guitar phrasing and some sultry slide work. Very nice! Luther Allison's What's Goin On In My Home is a super funky R&B blues style track with a lot of high stepping. Love really grabs the track by the short hairs with his vocal prowess. Domizio plays a bright articulate guitar solo over Neel riding the organ and Hyde laying down the funk. Super! Just As I Am opens with a super gospel feel highlighted by the piano and organ work of Neel. Allyn Robinson joins on drums and does a really nice job of sitting on the pace. Love's vocals on this track are even better than ever and with the warmth of the horns, this may be my favorite track on the release! Burgess is back on drums opening Shake N Bake, a TOP style track with hot horn funk. Hyde and Domizio really turn up the funk and with Lawson on vocals, you better be nailed to your seat lest you get fired for dancing at work... "Can't Hep Mysef" ! Excellent! Outside Love has the most traditional blues feel of all the tracks on the release, again with Lawson on lead vocals. Neel really cements the feel on this track and Domizio plays a healthy portion of slide backed by heavy horns giving it a great bluesy sound. Wrapping the track is funky Tater with really nice tandem sax work by the Smiths. Hyde really has the bottom moving on this track and Neel takes the opportunity to smoke the keyboards one more time leading up to an unconventional guitar solo from Domizio. Burgess and Hyde get a nice chance to show their stuff adding to the already smoking fire. This is an awesome release and one that you should really check out... but be ready to groove!